Even as foreign visitors to Yala rave about leopard sightings, leopard obituaries are becoming an all too common news item, leading one to wonder just how unsafe life has become for this magnificent lonely predator.The latest addition to the dead leopard list is the magnificent seven-foot ‘Panthera pardus kotiya’ caught in a trap in Top Pass woods in Nuwara Eliya last week. 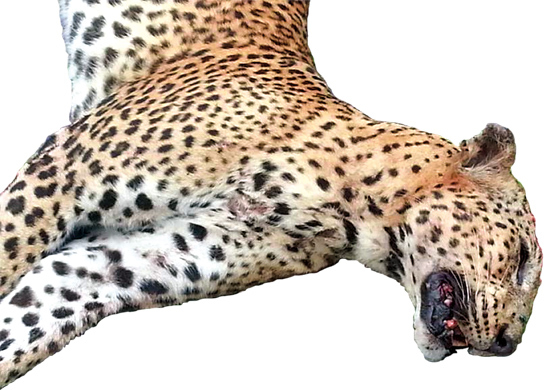 The leopard’s body was found by wildlife officers, and the corpse is now lying with the Nuwara Eliya Wildlife School. Taxidermy may preserve the animal showcasing a sample of the magnificent predator, but nothing underscores the tragedy of yet another leopard killed by human means, more so as the killing had occurred within the sanctuary meant to protect it. Whether the trap was meant for leopards or some other predator, one may never know. But the inescapable reality is that a snare is the worst way to kill an animal, especially a leopard. Health Byte : Stay restless!